There used to be a review here. Now there’s not. The Marathon Burger is not vegan. It’s not even vegetarian. The patty contains the house ketchup that is made with Worcestershire sauce, which contains anchovy paste. I have been informed by multiple servers that this patty was vegan. I can’t even tell you how disappointed I am to hear this, and how upset I am that after multiple inquiries I was assured that the patty was vegan. I will not be returning to Burger Up and I suggest you don’t either. A special thank you to my friend Lacey for discovering this fact after my emails to Burger Up went unanswered. If you have dined at Burger Up, like me, and have been misled, like me, I encourage you to contact them about your experience. Their information is below. UPDATE: As of December 2012, the Marathon patty is completely vegan. The house ketchup, however, is not, so keep that in mind when thinking about dipping your fries. Thanks everyone for contacting Burger Up with your concerns. Community action, it’s super effective! Beyond the Edge has a fantastic beer selection. They also have a fantastic buy-one-get-one happy hour special. And they have fantastic vegan food. I’ve written about this East Nashville gem before here and I will likely write about it again. It’s good, and it’s one of those places that keeps me coming back with varied menu options and, frankly, an awesome beer selection. Look at all those taps! And they have four kinds of Yazoo! It’s the only place in town of which I am aware where you can sample Yazoo’s A Beer Named Sue, which is a mysterious dark confection, and can potentially attribute the gravel in its guts and the spit in its eye to that name. A commenter on my last Beyond the Edge post informed me that the buns the restaurant uses are not vegan. I’m not sure if they are or not (as when I asked I was told they were) but to be safe, I opted for a bun-less meal this time. What you see in the photo is not on the menu. It’s kind of a cross between the veggie wrap and the veggie burger pizza wrap. Kudos to Beyond the Edge for (1) accepting a custom order; (2) not messing up a custom order; and (3) adding stuff to a custom order to make it even more awesome. I basically asked for the veggie burger pizza wrap but with more of a Tex-Mex twist. Since the veggie burger is a black bean patty, I thought it would be complemented nicely by avocado and salsa (instead of the cheese and marinara that came with the pizza wrap). The cook really went above and beyond, filling the wrap with lettuce, tomato, onion, carrots, and red cabbage. I dipped it in the little cup of salsa that came on the side. It was AWESOME. The blend of flavors was really fantastic – spicy burger and salsa, cool avocado and veggies. The carrots gave it a nice crunch factor. Plus, Beyond the Edge has my favorite fries in town. Look how delicious they are! This was one of the better lunches I’ve had in a while. I’d love to see it on the menu permanently … so you should go there and ask for it. Website – be careful, it plays music. Beyond the Edge is a really neat little sports bar in East Nashville. I really dig this place. They have a fantastic beer selection, great happy hour specials, and a substantial vegetarian menu. Plus there’s a patio. I love hanging out on the patio when the weather is nice, enjoying drinks and foods with my East Nasty pals. While their menu is available on their website, I included this photo of it for your convenience. Note that “Albacore Tuna Melt” is listed as a vegetarian sandwich, and “Albacore Tuna Wrap” is listed as a vegetarian wrap. I will forgive them this mistake since I like the place so much, but it’s still annoying. Had chips and salsa to start. It was pretty standard. A very watery but quite flavorful salsa with thicker-than-average chips. There’s not really much more to say about it. 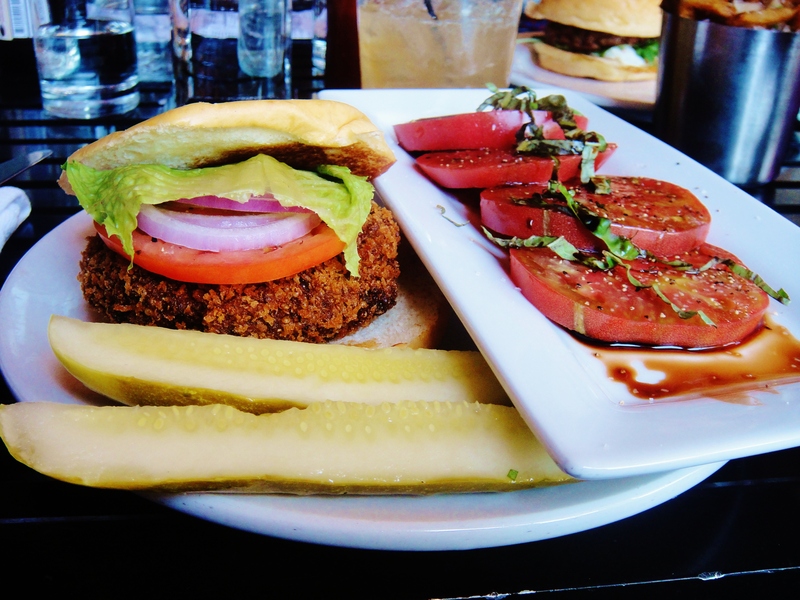 Beyond the Edge serves the Gardenburger Black Bean Chipotle patty, which is always delicious. The bun was soft and yummy, and toasted to a nice golden brown. There are cucumbers underneath the patty, and lettuce and tomato on the top half of the bun. Now, I asked for avocado to top the burger, and was informed they did not have avocado. This was confusing to me because avocado is listed as the first ingredient in the Veggie Wrap. I also asked if they had pico de gallo, and when my server said yes I asked for a side of that to top the burger. As you can see from the photo, what I actually received was a cup of chopped tomato. Disappointing. I just spooned some salsa on my burger, but it wasn’t what I wanted. I declined the french fries (which are quite good – seasoned curly fries) in favor of potato chips and a fruit cup. Those Sweet Maui Onion chips are effing amazing. The fruit cup was not very good. I was expecting fresh fruit, like cantaloupe and honeydew and grapes or something, but what I got seemed like it came from a can and there was a lot of liquid in the cup. Not impressive. Will I be going back to Beyond the Edge? Absolutely. I really love the vibe, and the beer selection, and the patio, and the veggie burger. And next time, I’ll be passing on the chips and salsa and fruit cup and I’ll stick with the fries. Website – a word of warning, it plays music. ETA: A commenter noted that the bun is not vegan. On my visit, I asked if the bun was vegan and my server told me that it was, but it’s possible my server was incorrect. If you’re dining at Beyond the Edge, I would recommend you ask about the bun and make your own assessment. Also, apparently they can sub out a different kind of bread, and you could also probably request to have the patty in a wrap. I had never been to Crow’s Nest before I wrote this post. In fact, I had never even heard of it before I went there. It’s basically a sports bar, but it’s two stories and it has two patios: one on the ground level one upstairs (two, really, if you count the one out front and the one out back as separate patios). Unfortunately, there is not much parking. The Green Hills Kroger is just across the way, and they have a ton of parking spaces (far more than are necessary for the shoppers) but they have all these signs about how you shouldn’t park there or you will be towed. Don’t tell anyone, but I parked at Kroger and didn’t get towed. Do that at your own risk. I met up with big group of people here, and it was a good setting for that. When I first saw the menu, I thought I would be eating french fries and a side salad, and I was pleasantly surprised to find a vegan veggie burger. This is a Gardenburger Black Bean Chipotle patty. A lot of local restaurants serve this patty, and it’s a reliable standby. You can also pick them up at most of the local grocery stores. I asked them for some fresh avocado to top it with (which is the best way to eat one of these: avocado and salsa) but they didn’t have any. I’ve had a lot of these particular patties and they’re really good as long as they weren’t cooked in a microwave. This one clearly was not, plus the bun was toasted–bonus! I didn’t ask if they cooked the patty on a separate section of the grill, but if that’s something that’s important to you I would suggest that you inquire about it. I also didn’t ask if the fries were fried separately from things like chicken tenders. These are things that are not important to my personal definition of veganism, but I understand that they are important to many vegans, so be sure to ask for yourself. Also, every time you talk to a server and say “I am vegan and I need vegan food,” we increase the demand for vegan products and awareness of veganism in general. On an unrelated note, it was happy hour when I was there, and beer prices were reasonable. Decent selection. The best thing about Crow’s Nest? It’s just down the block from Greenhouse Bar, one of the best bars in the city. They don’t serve food so I’m not featuring them, but you should definitely check it out as soon as possible, even though getting in and out of Green Hills is ridiculous. Website – if you check out the drink and food menus on their website, there are hilarious misspellings, like “Cutty Shark.” Additionally, Yazoo is listed as an import. That’s right, imported all the way from the old Marathon Motorworks building.